IP Address – IP address of the PLC. Port – port for the TCP connection to the PLC; please note that all Mitsubishi PLCs support only one connection / port. For multiple connections to the same PLC, set a different port for each mySCADA device. MultiBatch Optimized – enable this function if the PLC supports “Multiple block batch read/write” functions (codes 0406/1406). Enabling this option for a PLC that does not support such functions will cause a communication error. CPUTimer – set this parameter if you expect an extensive communication with the PLC or communicate with a heavily loaded PLC to increase the response preparation time on the PLC side. Optimization Window – this setting influences how “aggressive” the optimization of your request will be. If it is set to 0, each tag will be requested in a separate packet (slow, but helps to find errors in the syntax). With a default value of 1, all “adjusted” tags (D0000 and D0001, for example) will be requested in one packet. Setting it to 2 allows optimization to skip one tag address to the count tags as “adjusted” (for example, D0000 and D0002 will be requested in one packet with such a setting). Setting it to 3 allows it to skip 2 addresses, etc.. The maximal value for this setting is 20. Please note that if an error returns in response to the request, all tags included in this request will not be read. Use this feature carefully. The following block of settings is only required for hierarchy access within the MELSEC network of multiple PLCs – for a direct (local) communication, leave the settings at their default values. Please follow these steps to connect mySCADA to Melsec-Q, it might require some additional settings. 1. In right window “Built-in Ethernet Port Open Settings” Is required to turn on TCP MC Protocol on certain port – this port will be also used then in myDESIGNER when setting up the connection. 2. 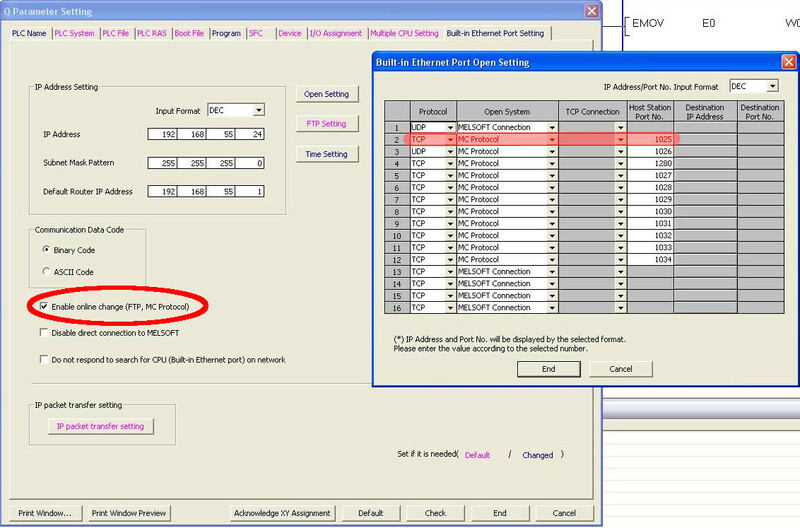 You need to enable “Online change (FTP, MC protocol) It’s needed to allow mySCADA to write into PLC.